Dana recently posted this question to me on Facebook and I thought I would answer it here so I could also receive your answers too! I generally think of myself of someone who is controlled and doesn’t deal with a “temper.” I get impatient, in fact, when I see other family members lose their temper when they could so easily maintain just a bit of self control and the entire situation so much less emotional. God may have given mothers secret eyes in the back of their heads, but for some reason, in order to spiritually refine us parents, He gave our children the knowledge of what our secret buttons are that only they can “push.” In less than 30 seconds they delete all our self-control and sometimes sanity, and persuade us to play on their playing field–one filled with emotions and loud voices; sometimes tears and dare I mention (shhh) throwing things. Admittedly, he had every reason to say this. He’d been through a great deal too, but my response was, “YOU don’t know how YOU’RE going to deal with it? It’s happening to ME!” (I never said to use me as an example). I tell you that story so you know that the rest of what I write are tips that I use, but not always as effectively as I would like. I make mistakes too. I try so hard not to lose my temper, but I’m not perfect. Use music to create a mood. The other day Josh had misbehaved and lost a privilege and was not happy with me. I was frustrated that he’d ruined a fun afternoon of plans and instead we were sitting at home. Both of us were grumpy and my husband was due home soon. I told Josh we were both grumpy and we needed to change our mood before daddy came home. I casually went to the kitchen and turned on the CD soundtrack from Top Gun and blasted it and grabbed his hands and we started dancing around and pretending we were airplanes landing. Soon we were making mac and cheese and I told him stories about the special stool he was sitting on. In less than 15 minutes a few choices I’d made had changed everything. Music is one of the best tools I’ve found for diffusing a negative mood. Your kids need to see you go to the Lord and ask for help and forgiveness. Use their tools. My son has a set of books called, “Dear God, I Need to Talk to You About…______” and one is temper. Amazingly, when he loses his temper, afterward he will ask me if we can read that book. It calms him down, gives him an understanding that losing tempers happens and no one is perfect, and how to ask people and God for forgiveness. When you lose your cool, ask your child if he wants to read the book with you because you need to read it. I recently heard a great review on a book called William Battles the Anger Squiggles by Dr. Laura (read it here). My son was in the car and said he wanted the book and I recently ordered it (haven’t received it yet). The funny thing is Dr. Laura emphasized just how good of a book it is for any age – adults included. Reading a book like this, especially after an episode, can be a great tool for teaching your child how to cope with angry emotions. And I think it’s important that you use tools that they can imitate and use too. Know the signs and avoid anger. Just because you have a justifiable reason to get angry, doesn’t mean you should get away with expressing it. Pain and chronic illness can give us a million excuses to feel angry and last out. But we can’t give into it. Learning to take care of yourself should be one of your priorities, so do what you have to do to control it. Do you need emotional or spiritual support? Perhaps a support group for your illness or a Bible study would help. Do you need to get out of the house and go have two hours by yourself a couple times a week just doing something fun? Would the support of other mothers help? Consider joining a Christian moms group or a playgroup where you can discuss what sets you off and find out how others cope. Take some time to find out what you need to be a happier person to be around. My son is just 6, but I can already see that it’s not the big events like going to Legoland that he will remember, but the every day patterns of life. What kind of mood am I in when I pick him up at school every day? Does my face light up when I see him? Do I show him how much I love him? We get so caught up in trying to make sure we are in a “good mood” and light-hearted for a day at the fair, but what it really comes down to are our day-to-day habits and how they impact our child. Identify if you have anger issues and work on them. Don’t hide it because “good Christian moms never lose their temper.” One of the best Christian mom books I’ve read on this is She’s Gonna Blow! Real Help for Moms Dealing With Anger by Julie Ann Barnhill. Gary Chapman, author of The Five Love Languages of Children, tells readers that Julie Ann Barnhill “has learned from her journey, and so will you…You’ll identify with Julie’s open, honest approach.” The description says it is, “Straightforward and easy–to–read, She’s Gonna Blow! is for every mom seeking here–and–now hope and help to… (1) find healthier ways of expressing anger; (2) let go of “control” issues and be more positive; (3) draw closer to the God who created moms and mothering. There is no such thing as a perfect mom, but I think that expressing our emotion of anger around our child (whether directed at him or her — or not) is one of the most scarring things we can do to them. It is simply not acceptable. Even when someone in my house is mad at a situation, or mad at themselves, it impacts my life and emotions a great deal. Being “angry with your illness” creates a mood in your house that will change your child’s entire life–and not for the better. And one of the greatest gifts I believe we can give our children is the ability to learn to cope, express and control their emotions. I’m looking forward to your answers to Dana’s question too. How do you cope? From One Angry Mom to Another: An Interview with Julie Barnhill, author of She’s Gonna Blow! The good news? 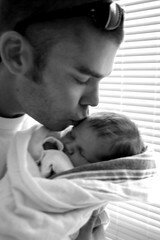 Dads do matter in the lives of an infant more than previously thought. The bad news? If Dad is depressed, it impacts the life of a baby even more so than previously thought too! Any woman married to a man who has dealt with depression has always known how much the mood of her spouse can rub off onto her children and herself, but now a new study published in the July issue of Pediatrics has proven it to be so. To see how parental depression was related to excessive crying, van den Berg‘s team gathered data on symptoms of depression among parents of 4,426 infants who were 2 months old. Not surprisingly, “Researchers found a 30 percent higher risk for depression among parents whose infant cried excessively.” Anyone who has had a crying baby hours upon end know how it can get discouraging and downright depressing! People who live with chronic illness have a much greater risk factor for dealing with clinical depression. And the feelings of having a child who is crying and not being able to figure out what is wrong, can be overwhelming. Parents with illness can also be dealing with money concerns, medical issues, balancing where one’s energy is spent, and worrying about the future. But being a parent can also be one of the most exciting, rewarding, and wonderful gifts God gives us. John 14:27 says, “Peace I leave with you, my peace I give unto you: not as the world gives, give I to you. Let not your heart be troubled, neither let it be afraid.” Not only is this good advice for our own lives, but because our moods and our worries effect those we love the most, even the smallest babies. Should I have a child? Can my body handle a safe pregnancy? When? How long should we try? Will the child have my illness? What are the odds? Can I take my medications while pregnant? Should I adopt? Will anyone give me a child with my illness? Can I do it? What if I find out I can’t? What if my spouse doesn’t help enough? What if I decide not to parent? How do I explain my decision to people? How much do I say? How can I raise my grandchildren? Where do I get the energy? What if I can’t do it? How do I say no? How do I explain I want to but my body won’t let me? How can my child work and earn money for the family if I don’t provide free child care? As many of you know I am the mom of a 6-year-old son. (He’d say “six and a half.”) My husband and I adopted Joshua at birth and he’s the little spark and twinkle in my life that keeps me going. But yes, being a mom is hard. School got out for the summer Thursday. Friday I realized just how much energy he really does have after spending a full day with him. Saturday I awoke with a really bad flare. We’d planned to go to Legoland to celebrate “out of school!” and because it was “Star Wars” weekend. Josh said, “Let’s wait until tomorrow to go because we want Mommy to go, right, Dad?” Ah. . .what an amazing kid! Only. . .Sunday (today) rolled around and I was flaring even worse, this time with my knee out of place all night despite extra medication and thermal wraps. Hands still like claws. Josh was okay with just going with his dad and they got home an hour ago. It was a special time. I went to the grocery store for a few necessities and did some stuff around the house. My parents arrive next week and we’ll all go to Legoland then, (we have summer passes) so I told myself it was no big deal. These moments will come when you are parenting with a chronic illness. I have some blog posts coming about parenting with an illness. I am also working on a moms with illness Christian book. I see all of this as a need. At the same time, I want to be sensitive to those of you who read this who do not have children, those of you who have perhaps lost a child (either in heaven, or maybe to an ex-spouse.) And I know many of you made a decision not to parent (some because of your illness) and though you are okay with that choice, you may still grieve it. I’ve gotten a lot of feedback on it over the years. So if you are not a parent, please know I have no plans to turn this into a mommy blog. If you are a parent, know that I have heard your pleas of “how can I survive the summer?” and I will be sharing my own successes and struggles with you and hope you will share too so we can all make it a wonderful summer together! Are you a Christian work at home mom? I wanted to take a moment to say thank you to the Christian Work at Home Mom web site that recently featured my article, When Your Friend Has a Chronic Illness – How Moms with Illness Need Encouraged. Being a Christian work at home mom with an illness is quite a calling! I have been doing “it” for 6 years now… not always gracefully, not always with sanity, and often in PJs, but because of your grace, it’s been one of the most amazing experiences. CWAHM is the place where Stay at Home Moms, Working Moms and WAHMs find Work at Home Success! Since 2000, Christian Work at Home Moms, CWAHM.com, has been providing resources to help women find great work at home careers. We also strive to help moms market their home businesses at a fraction of the cost of other websites. You can find everything you need – from articles, job listings and work at home ideas to freebies, advertising, custom banner design and so much more! Tune in every Tuesday at 11am EST for the LIVE CWAHM Podcast! I am planning on having a speaker give a seminar during National Invisible Chronic Illness Awareness Week on how to be a work at home mom with an illness. If you’d like a blog on the topic to be considered, please let me know and be sure to tune in for the show too.